E-commerce continues to grow at an unprecedented pace. Total retail sales, excluding the sale of items not normally bought online — like fuel, automobiles, and food at restaurants — hit US$3.628 trillion last year, up 3.9 percent year over year from $3.490 trillion, according to Internet Retailer data. E-commerce accounted for a 14.3 percent share of that total, and 51.9 percent of all retail growth. That is substantial, and it has encouraged many people to take advantage of the booming opportunity in e-commerce. In this continually crowded market, it can be difficult for SMB owners to compete without the right tools in place. How can SMBs move away from the stressful and manual one-by-one shipping processes and streamline as the big businesses do? It’s easier than you may think. Automation and technology are the keys to success. Chances are, SMBs don’t have a shipping department. It’s entirely possible that the entire business is the shipping department. It is difficult to grow a business when a single person or a couple of staff members are struggling to keep up with orders. If you are a SMB, does this scenario sound familiar? You come into the office in the morning and begin processing orders. You pull up an order, print a label via pdf, print a packing slip via pdf, mark the order as processed or shipped, perhaps copy and paste the tracking information into a spreadsheet for safekeeping and to send to customers, and you then move on to the next order. Rinse and repeat. That doesn’t lead to successfully scaling a business. Larger companies are using automation to cut the time it takes to process orders, turning what would require hours into processes that take literally minutes. SMBs can follow their model if they properly automate. The term “automation” may conjure up images of large warehouses with well-oiled machines pumping out thousands of orders per day. When it comes to shipping automation, think more along the lines of IF/THEN statements. 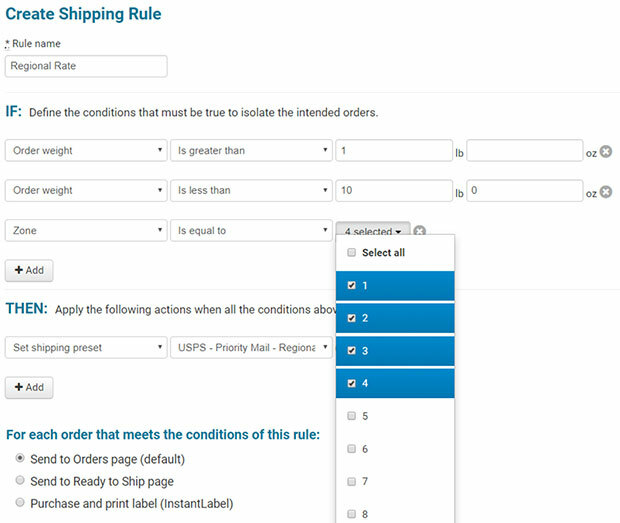 There are numerous software options out there that allow the opportunity to build shipping rules. These are nothing more than logical statements that tell the software how to process orders without the need for human interaction. If package weight is greater than 1 lb. and less than 10 lbs. AND going to Zones 1-4, THEN apply Regional Rate Box B (depending on the size of your products, this could also be Box A). When you have multiple orders that are shipping with the same carrier and service, most shipping software solutions allow you to batch print. Rather than selecting orders one-by-one and printing each label individually, you select all of them and simply hit print on the batch. This also can apply to packing slips, in the same order, so it’s an easy match-up process for the person packaging the orders for delivery. Coupling automatic shipping presets with batch printing can reduce an operation that would drain hours from the day down to literally minutes. Aside from automation, being able to compare rates quickly and efficiently is a major time-savings all SMBs need to adopt. We often hear from e-commerce merchants who are literally entering dimensions and weights into USPS.com, then FedEx.com, and UPS.com and changing each to compare and contrast. Is that something that sounds familiar? The right solution will put all those comparisons in a single screen so all you have to do is select the carrier and service to see your shipping rate. This enables shipping that is not only efficient, but also smart. Many SMBs have been taking advantage of the fact that people shop all over the Web. Simply having a store set up on a website might not cut it, particularly if the business is trying to grow or gain exposure to new customers. Selling on marketplaces like Amazon, eBay, Etsy, Walmart, Bonanza and others, while also running a Shopify, BigCommerce, Magento, Volusion or other store, has become the new norm for SMBs. This adds another level of time consumption when trying to process orders from each store, because these channels don’t talk to each other. It is imperative to have a single platform that pulls in orders automatically. This makes the task of processing orders easier, and it avoids the possibility of missing an order when switching between browser tabs. Particularly if working under the tight time constraints of selling Amazon Prime orders, improved efficiency could mean the difference between successful selling and losing the ability to sell. Multichannel selling ties in with automation to exponentially streamline processes. By coupling it with batch processing, a SMB can process labels for orders from all selling channels at the same time, and package them in a way that simplifies how the day is managed. The most difficult thing for SMBs, when it comes to management of their shipping processes, is how much it takes away from other important aspects of the business. Elements like managing inventory and marketing for growth can get shortchanged when so much time is sunk into processing the day’s orders. As is the case with shipping, SMBs may not have entire teams dedicated to managing inventory, customer communications and marketing. These processes may very well be handled by a team of one. It’s possible to have many of them automated through a platform. Order data is a powerful tool that can inform many other automated processes. For example, customers want tracking information so they can follow their package to their door. Rather than manually copying and pasting tracking emails from the carrier, that information can be sent automatically to customers and the stores they purchased from, error-free. Shipping data can inform email marketing campaigns such as welcome emails, “buy-it-again” reminders, and win-back campaigns. The need for up-to-date inventory based on sales is vastly important. This is especially true for anyone using a spreadsheet or shared document and had a mishap in updating information. The outcome of that situation is a nightmare for SMBs. They need to hold on to every customer they can to keep them from going to larger retailers. Adopting a new process may seem like a pain. In some instances, it can be, which is why a little research may be required. Look for solutions that offer some onboarding assistance and have great customer service ratings. Even with do-it-yourself models, setting up and getting started may be easier than you think. Often, connecting to a store is necessary, which usually is as easy as entering credentials. In some cases, it may require an API integration, but if SMBs use any of the major stores and marketplaces, it should be pretty straightforward. If a solution provides better shipping rates, it may be necessary to get set up with a new USPS account. This often does not come with an added cost and should be an automatic part of the signup process. However, make sure you can import FedEx and UPS accounts yourself, if applicable, to access any rates that may have been negotiated with a rep.
Once the stores and marketplaces are added, orders will begin to pull into one place. Be sure to set up automation IF/THEN statements like the ones mentioned above. If the solution includes onboarding, a specialist should be able to assist in creating automation rules that make sense for the business and products. If not, search through any knowledge base or support documentation provided to find some helpful shipping rules. A little investment on the front end is what leads to hours of savings later. The ability to ship like larger businesses isn’t as inaccessible as many SMBs think it is. With the right technology stack and some time investment up front, SMBs can be well on the way to streamlining and building their business. ShippingEasy, a complete solution for e-commerce merchants to automate order imports and shipping, manage inventory, and increase sales through customer email marketing and online reviews. It provides powerful integrations with leading online channels such as Amazon, eBay, Etsy, Walmart, Shopify, Magento, WooCommerce and many others, allowing merchants to manage orders, products and customers from everywhere they sell — all in one place. ShippingEasy is a wholly-owned subsidiary of Stamps.com (Nasdaq: STMP). After a limited four-month trial period, T-Mobile is finally launching its T-Mobile Money banking service to the entire U.S., offering a powerful banking service with extra perks, and none of the usual fees. It’s not your usual banking service. As you might expect, it’s proudly mobile-first, which means a powerful mobile app on your Android or iOS smartphone. Boot up the T-Mobile Money app and you’ll be able to do everything you expect from your banking service, from checking your account balance to sending checks, or even sending direct person-to-person payments. The app also supports Apple Pay, Google Pay, and Samsung Pay, biometric logins — including fingerprint sensors and Face ID — and also comes with the ability to lock a lost debit card or send an alert when your balance is low. But a nifty app isn’t the only benefit T-Mobile is offering — users will also get an industry-leading interest rate on their savings. Every customer will get at least a 1.00% Annual Percentage Yield (APY) on their balances. T-Mobile customers who deposit at least $200 a month will receive a 4.00% APY on accounts up to $3,000 — a rate T-Mobile claims is 50 times the average U.S. checking account interest rate. Once you’re above $3,000 then you’ll earn 1.00% APY on every dollar over the threshold. Best of all, T-Mobile is dedicated to preserving as much of your money as possible, and won’t charge any of the usual bank fees. That means no overcharge fees, account fees, or charges for withdrawing your own money. Additionally, if you’re a T-Mobile postpaid customer, then you also qualify for Money’s Got Your Back overdraft protection, which gives you a $50 overdraft without charges, as long as you pay it back within 30 days. It’s not only your money it’s protecting, either, and T-Mobile has confirmed to Digital Trends that it will not sell or share customer data, and neither will Bank Mobile, the bank supporting Money. There’s no need to worry you’re restricting yourself to a digital-only account either. T-Mobile Money comes with a Mastercard debit card, and you can withdraw cash (free of charge, remember) from over 55,000 Allpoint ATMs worldwide — including ATMs from Bank of America, Chase, and Wells Fargo. T-Mobile Money is also FDIC-insured up to $250,000, and comes with 24/7 bilingual support. This has been a longstanding ambition for T-Mobile, with similar efforts launching in 2014. To get started, you can download the T-Mobile Money app for Android or iOS, and sign up with your T-Mobile ID. If you’re also looking to keep a tighter hold on your money as well as boosting it with Money’s APY rate, then check out our favorite budget apps for Android and iOS. Take control of your workflow with a tool like Plutio, on sale for $29. Freelancing can be great — all that freedom to be your own boss, plus you can work in your underwear. But there’s another side to freelancing that isn’t as fun: the side that includes project management, time tracking, invoicing, proposal writing, and lead generation. Plutio is an app that takes the headache out of your hustle. Designed with freelancers in mind, it’s an all-in-one tool that caters to your every need, so you can free up time to do actual work. Garnering over 1,700 upvotes on Product Hunt and named one of the “Top Ten Essential Tools For All Freelancers And Micro Businesses” by Forbes, Plutio offers a helping hand in almost every aspect of your workflow. It lets you send invoices in a snap and track when they are opened, and gets you paid swiftly with a variety of payment methods including PayPal and Stripe. The tracking tool allows you to better account for your time, and the task management feature lets you organize your to-do list in a way that will help you stay focused. Plutio can also aid in contracting more gigs. You can use it craft eye-catching proposals that clients can’t say “no” to, and legally-binding contracts that allow for easy and secure signing. It even comes equipped with a Client Portal where you can communicate and collaborate with anyone in your business in real-time. Get a 1-year subscription today for $29, a 3-year subscription for $39, or a lifetime subscription for $59. There will be 200 million smart speakers by the end of 2019, analysts say — including a 166% year-over-year growth in the market for smart speakers in mainland China alone. That’s kind of nuts, even in a booming global economy. 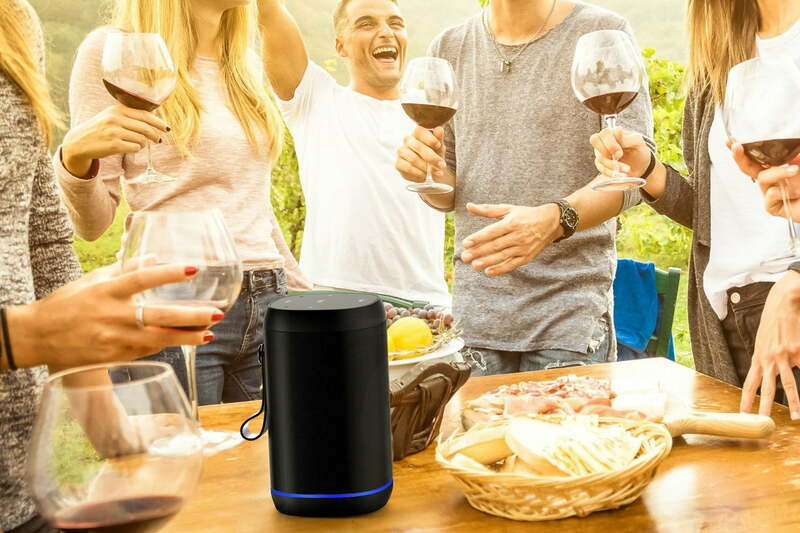 Worldwide, the smart speaker installed base will grow about 85% from 114 million units in 2018 to more than 207 million units in 2019, according to a report from analysts at Canalys this week. The United States is expected to lead the way when it comes to smart speaker adoption. The U.S. accounts for more than 42% of the smart speaker market install base. The U.S. is running at about 46% growth in the smart speaker market, according to Canalys, moving those of us here in the United States from a shade over 60 million units to almost 90 million units in 2019. The real kicker in the report is the outlook for China, one of the most lucrative markets on the entire globe for technology. Weirdly, global giants like Amazon and Google don’t pay that much attention to the Asian markets, which means brands that are unfamiliar to Western audiences like Alibaba’s Tmall Genie, Xiaomi’s Xiao Ai, and Baidu’s DuerOS, are going to overtake the big manufacturers. Canalys predicts that Tmall will hit nearly 40% of the 2019 smart speaker market in China, followed by a quarter of the market for Xiao Ai and DuerOS and about 12% for everybody else. China’s smart speaker installed base is expected to reach nearly 60 million units by the end of this year. That’s a crazy amount of growth, given that the country only had about 23 million units in 2018. The real driver that smart speaker manufacturers may be concerned with next is just which digital assistant is driving their platform. Amazon’s Alexa has been in the lead for some time, while the worldwide market is expected to reach 8 billion by 2023 after reaching 2.5 billion in 2018, according to Juniper Research. But with Facebook jumping into the digital assistant market just this month and Apple’s Siri and Google Assistant hot on Alexa’s heels, it should be interesting to see which one of the smart speakers comes out on top.